Mental Health and More...: Anxiety, OCD, Depression, Panic Disorder: An Alternative Homeopathic Treatment! Anxiety, OCD, Depression, Panic Disorder: An Alternative Homeopathic Treatment! 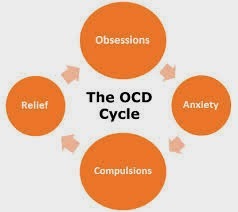 Several years ago I had the privilege of speaking to an expert on obsessive compulsive disorder. Her name was Suze Harrington, LCSW and she had a small clinic in Salt Lake City, UT. She provided bio-behavioral mental health counseling for people who struggled with anxiety, OCD, and other related disorders. Those of you out there who struggle with obsessive thinking and compulsions understand well how difficult it is to be plagued by something you feel very little control over. Ms. Harrington informed me of a homeopathic treatment that had received medical trials called Inositol. Naturally, I went home and logged on to the medical journals and found a few articles. Sure enough, it had been reviewed and even had a few double-blind studies where it was one of the treatment methods along with Luvox and a placebo. The results were very promising and had little to no side-effects. Typically, when you review the dosage on a bottle of Inositol, it will say to take 250 mg per day. In the medical studies, it said that a therapeutic dose was 12-18 grams per day. Therefore, Ms. Harrington recommended that a person take 1-1.5 tbsp X 3 per day. That can bring it up to a full therapeutic dose. The medical studies agreed with the amount. Ms. Harrington turned my attention to www.iherb.com where it can be purchased for a fairly reasonable price. She indicated that Insoitol Powder, Jarrow Formula (8 oz. bottle) is what she recommended to her clients. Though this brief article is not a plug for iherb nor for Ms. Harrington, I have seen people have very positive results in using Inositol Powder as an alternative for a Selective Serotonin Reuptake Inhibitor (SSRI) for depression, anxiety, OCD, or panic disorder. P.S. When reading the medical journals, it indicated that the liver breaks down Inositol (which is derived from rice bran) into inositides. Inositides are involved in many functions, but in this case, their job is to help with cell-to-cell communication. It is also good for liver detoxification. If you want to learn more, here is a good blog article written simply to help people like you and I understand what it can do and how it works.